To understand the default recommendation for litter box management following radioiodine therapy for hyperthyroidism there are a few concepts that one needs to understand. First, the radioiodine given to cats with hyperthyroidism is rapidly distributed throughout the cat's body via their blood stream. Upon arrival of the radioiodine at the thyroid tissue, the functional thyroid tissue (this is the adenoma in hyperthyroid cats) removes the iodine from the blood stream and concentrates it within the thyroid adenoma cells for use in making thyroid hormones. As a result shortly after dosing cats with radioiodine, relatively little of the iodine remains in their blood stream. Second, what little remaining iodine that continues to circulate in the patient's blood stream is rapidly excreted by the kidneys into the urine. This means that the clumps of urine in the cat's litter box represent the most accessible radiation hazard. Third, radioiodine therapy for human patients with hyperthyroidism was first performed in 1941. Cats were not diagnosed with hyperthyroidism until 1979 and the first report of hyperthyroid cats being treated with radioiodine was published in 1984. So, for 43 years, the only patients treated with radioiodine were humans who flushed toilets. As a result the regulatory agencies responsible for overseeing the use of radioactive materials for medical purposes rapidly adopted the sanitary sewer as the solution to the problem of what to do with patient's radioactive urine following radioiodine therapy. Interestingly the short physical half life of 131I combined with the massive dilutional effects of the sewer system resulted in the ongoing use of the sewer system for this purpose. In 1984, when radioiodine therapy for hyperthyroid cats was introduced, regulatory agencies responded by requiring that hyperthyroid cats' radioactive waste be flushed into he sanitary sewer system just like their human care providers. As a result, the default recommendation for managing the litter box contents of hyperthyroid cats treated with radioiodine is to flush the waste into the sanitary sewer. Luckily numerous brands of biodegradable and hence flushable cat litters (e.g., World's Best, SwheatScoop, and Blue Naturally Fresh) are available. Lets face it, some cats are more particular about their litter box accommodations than others. Some cats have spent over a decade fine tuning their litter box material preferences and will react negatively, read eliminate elsewhere, if a sudden change in litter box filler (e.g., flushable litter) is forced on them. And cats with hyperthyroidism are generally stressed by their disease and hence primed to over react to changes in their environment. Clearly this is not a good scenario and hence an alternative to switching cat litters should be available. The nature of the short physical half-life of 131I prompts consideration of another solution to this situation. 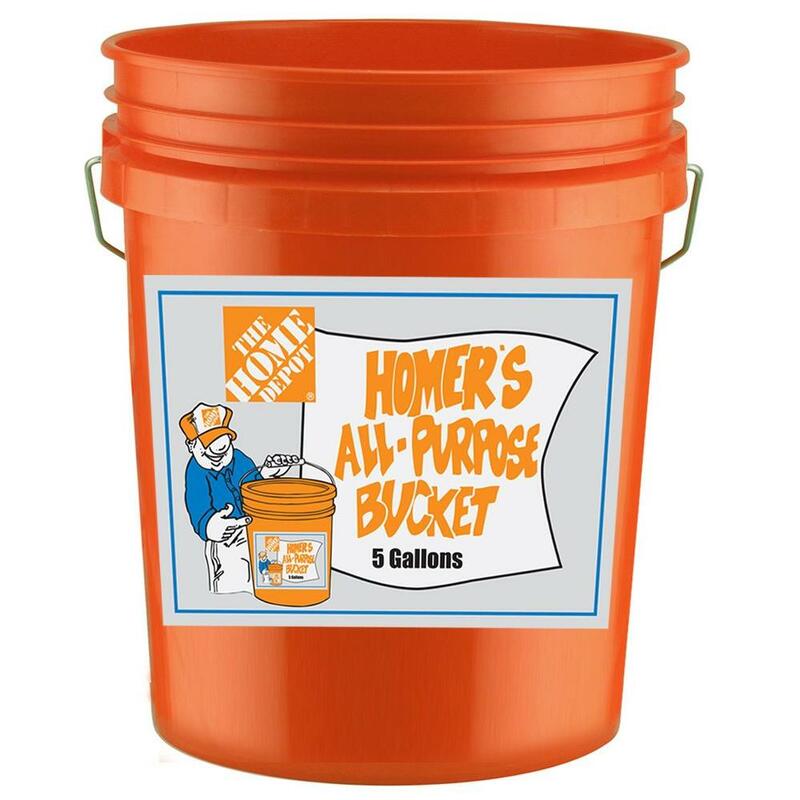 Empty 5-gallon buckets, like those used by professional painters are available from virtually every hardware store for a minimal investment. These can be positioned in the home next to the litter boxes allowing collection of the clumps from the box using any clump-able cat litter. Following collection of the clumps of radioactive waste, the lid can be tightly sealed and the waste held for 3 months (a minimum of 10 half-lives is needed) after which the waste can be disposed of in the regular garbage. It is important to hold the waste for the minimum of 3 months to ensure that you do not trigger an alarm at the landfill. Landfills screen all of the waste passing through their entrance gates using stationary geiger counters past which the garbage trucks have to drive. Setting off an alarm requires the contents of the truck be inspected by a representative, typically a physicist, of a local health agency. Identification of the source of the radioactive material in the waste has the potential to lead to various mandated responses which can include the application of fines. How does having another pet at home complicate the management of my hyperthyroid cat upon its return home from its radioiodine therapy? Cats discharged following radioiodine therapy for hyperthyroidism are still excreting radioactive iodine in their urine. As a result clients need to utilize appropriate oversight to prevent canine family members for consuming the litter box contents for the interval after radioiodine therapy during which the cats' urine is still radioactive. In multi-cat households, cats generally share litter box resources. However unlike dogs whose unusual culinary habits occasionally include the litter box contents, cats typically manage their litter box behavior to avoid the consumption of its contents. This means that it is OK to allow other feline family members to share litter boxes with the post radioiodine therapy hyperthyroid cat patient. A reliable, clumping litter should be used to minimize the potential for nonradioactive patients interacting with radioactive waste in the box. Of course there are a few consequences to allowing other feline family members to share a litter box with the post radioiodine therapy cat. Most notably will be the increased volume of cat litter that needs to be managed. Depending on the number of cats involved and well as their urine production, this can amount to a significant volume of litter to flush. Additionally, each new cat forced to make a switch to a new (i.e., flushable) litter, represents another potential for aberrant litter box behavior. It just takes 1 cats urinating outside of the litter box for 2 weeks to establish a trend that others may find appealing in the days, weeks and months to follow. As a result clients with multiple cat households, who would like to avoid isolation of their hyperthyroid cat following its return home following radioactive iodine therapy should consider holding clumps of cat litter for decay (see plan B above). Looking for a good resource to help you understand your cat's behavior regarding its use of the litter box or anything else? 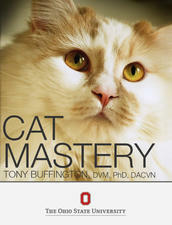 Please consider purchasing Cat Mastery by Tony Buffington. This wonderful ebook is available for download at the iBooks bookstore.